If you use WordPress and are worried about being hacked or compromised, or you just don’t have time to keep up with the frequent updates and maintenance, we just launched a service made for you. WordPress hardening for maximum security. Monthly updates of WordPress core, Plugins and Themes. One of our in-house WordPress security experts will personally examine your WordPress installation for malicious files and signs of compromise every month. If your WordPress installation is compromised or hacked, we’ll clean it up. Configuration of automatic WordPress site and database backups. WordPress-specific support and personalized assistance. You can learn more about Managed WordPress Hosting and find a link to sign up here. The Managed WordPress Hosting service includes the Winhost Max Plan, so if you are an existing Winhost customer and already have a hosting plan, contact us for pricing or open a helpdesk ticket and we’ll take it from there. Every day we clean up compromised WordPress sites for our customers. For them it’s an inconvenience and an expense that they weren’t expecting and don’t welcome. But since WordPress is the most popular blog/CMS application in the world, it’s a natural target for hackers. If everything in your WordPress installation is not up to date, you are at risk. And unfortunately, even if everything is up to date, you can still be vulnerable. That’s why Managed WordPress Hosting includes a WordPress hardening service, to increase security and reduce the chance that you will become a victim. So if you love WordPress but could live without the constant maintenance and security tasks, let us do it for you! We’re rolling out a change to the email system that you should be aware of. The “postmaster” account is set up by default when we establish email service for a domain, but you have the ability to delete that account. The problem with deleting postmaster@ is that some important messages can be addressed to that address, and that’s because the SMTP RFP says the postmaster account for a domain is required to accept mail. The change we’ve made is implementing behind-the-scenes forwarding that makes your primary domain admin the “postmaster” account (assuming you have deleted the postmaster@ account – if you have not deleted that account, you won’t see any changes). What that effectively does is ensure that email addressed to the postmaster@ address for your domain is delivered. The side effect of this change is that you may see an increase in spam on your primary domain admin account, since spammers sometimes send to postmaster@, assuming that it exists on every domain (because they know that it’s supposed to exist). A possible increase in spam is an unfortunate side effect of this change, but the alternative is the possibility of missing legitimate email addressed to your postmaster@ address. Those legitimate messages can be important, so we had to weigh the value of those important messages against the possibility of an increase in spam. It’s worth noting though that we made this change on a small group of servers a couple of weeks ago, and we didn’t receive any feedback regarding an increase in spam, so the likelihood is you won’t notice much of a change with this new configuration. As always, if you have any questions or concerns, open up a support ticket and let us know. When you open an account at Winhost we set up your website space immediately so you can start uploading files right away. But if you have an existing site hosted elsewhere, you will most likely want to get everything set up here and test the site before you actually point the DNS to Winhost. The Secondary URLs make that possible. 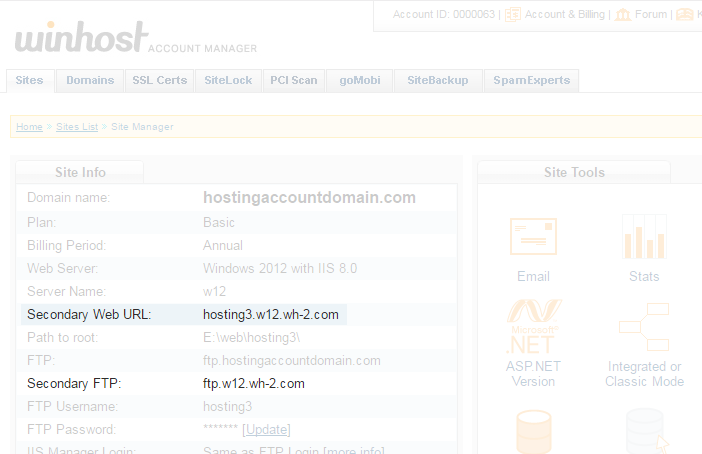 Your permanent FTP URL is ftp.HostingAccountDomain.com (where HostingAccountDomain.com is your domain name). But of course that URL won’t connect to the server here until your domain points to our servers, so we set up the Secondary URLs, both for FTP and web access. So the Secondary FTP URL (ftp.w12.wh-2.com in the example here, yours may be different) is what you use in the “host” field of your FTP software to make the connection. Then when you want to view your uploaded files, you would visit the Secondary Web URL, in this example, http://winhostc.w12.wh-2.com. After your domain’s DNS is pointed to Winhost and your site is up and running, you can use the Secondary Web URL for troubleshooting purposes. For example, if it seems that your site is unavailable, try entering the Secondary Web URL into your browser. If the site comes up, there’s a good chance that domain registration or DNS issues are the culprit. When a site is unavailable, domain related-issues aren’t usually the first thing we think of as being the source of the problem, but even the most diligent among us can let a domain registration lapse, or make a mistake in DNS settings that takes our domain off line. Once your domain has been updated to point to our servers, remember to update your FTP software to use ftp.HostingAccountDomain.com (your domain name) as the host. And you should never use the Secondary Web URL as a link to your site from another site or social media platform, or hard code it anywhere in your site. We make this recommendation because while it’s unlikely that the Secondary URLs will change, it is possible. They have changed for various reasons in the past. So once your domain points to our servers, only use the Secondary URL for troubleshooting purposes. Never as a link to your site.